Give egg industry survivors a second chance at life! 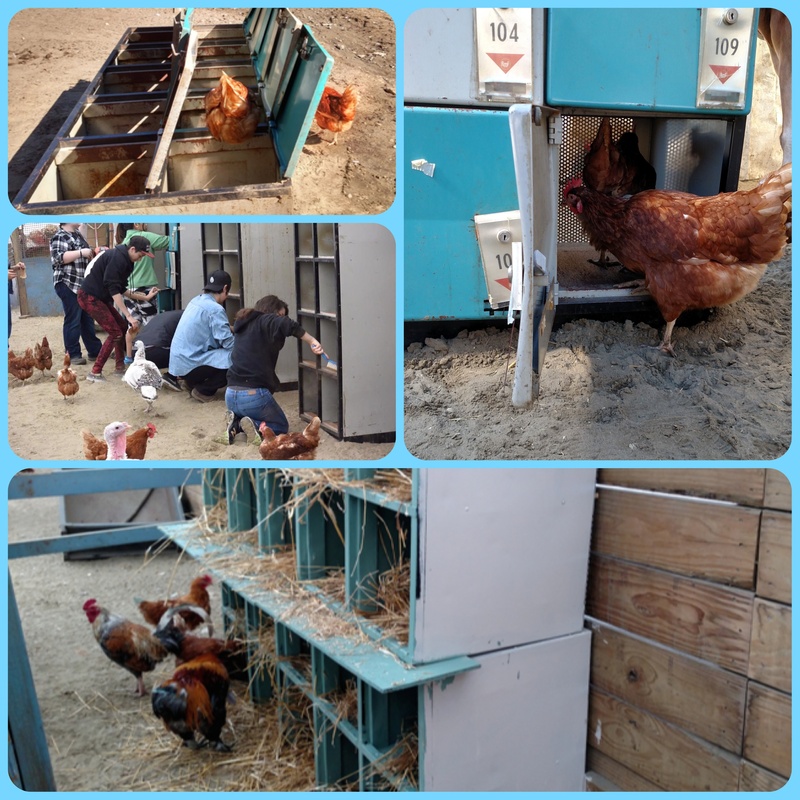 In the past month, VINE Sanctuary has welcomed a total of 90 hens from both large- and small-scale egg farms. 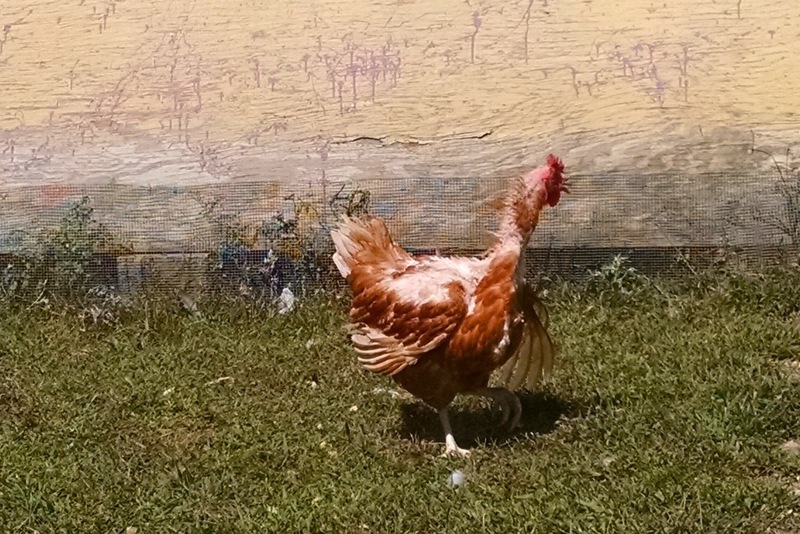 Most of these hens had never been outdoors before coming to the sanctuary. We were so happy to welcome them into fresh air and sunshine, but so sad to see that they had been debeaked. We had to cut rock-hard balls of dried excrement off of most of their toes. Others had been treated less harshly but still showed signs of exploitation, such as feather loss and being underweight. The hens themselves are SO HAPPY to be here, spending every day from sunrise to sundown exploring, socializing, sun bathing, and eating like it's going out of style. The up-the-hill roosters are DELIGHTED to be sharing their coops with hens again, and this has already changed the culture of their community for the better. Other animals at the sanctuary, such as Truffles the pig, seem ENLIVENED by the opportunity to make friends with these clever and sociable birds. The only downside is that these hungry hens will be adding an unanticipated $450/month to our feed store bill. You can help! Because we buy scratch feed, black oil sunflower seeds, and high-nutrient pelleted feed in bulk, augmenting this with donated produce, we can feed an average hen an organic, locally-sourced diet for just $5 per month. 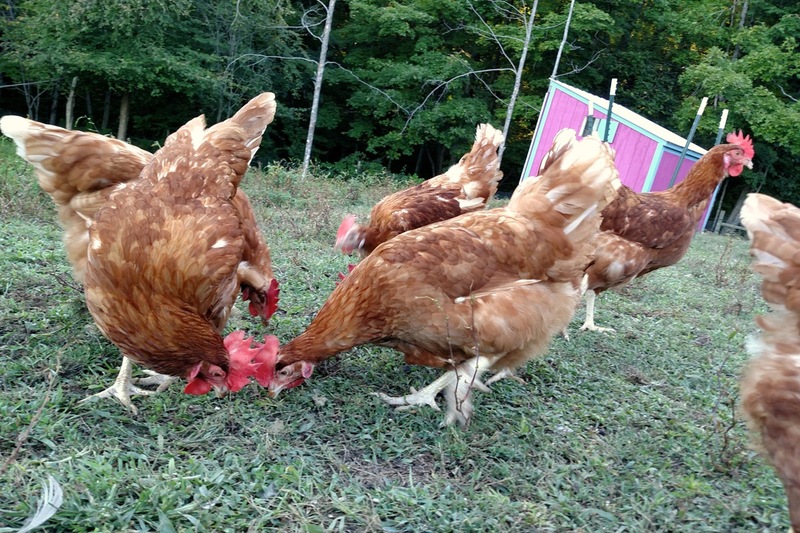 Give today to help us cover the costs of feeding the new hens through the end of the year! Make it monthly, by clicking the check-box to automatically donate the same amount each month, and we will sign you up to receive regular updates on the adventures of the new hens along with a special newsletter just for people who sponsor animals at the sanctuary! October 28th UPDATE: With just four days and just under halfway to go, an anonymous donor has stepped up with an exciting challenge: They will match every gift to the fund up to a total of $2,500! That means that your donation will be doubled!! Yesterday, the hens who had never been outdoors before coming to the sanctuary made an amazing discovery: Sometimes white icy flakes fall from the sky and then blanket the ground. Even though it's rainy today, many are out and about, investigating the properties of slush. While they're busy figuring out white stuff, we've got out eyes on the green, with just four days left in our campaign to raise the funds to feed these new sanctuary residents through the rest of the year. Luckily, an anonymous donor has stepped up with an amazing challenge: They will match all donations to the Hungry Hen Fund, up to a total of $2,500! So now all donations to the fund will be doubled!! Here at VINE, we squeeze every dollar till it hollers, so donors can trust that we'll get the most bang out of every buck. Here's an example of our thrift, as well as our commitment to the environment. Rather than waste money or materials building nesting boxes for the new hens, we "up-cycled" old bowling alley lockers! As you can see, the hens themselves "helped" every step of the way. Thanks again to everybody who has donated to and/or shared this campaign. Keep it going, so that we reach our goal and the hens stay happy! VINE Sanctuary is an ecofeminist and LGBTQ-led farmed animal refuge in Springfield, VT. While caring for more than 500 nonhuman animals at our solar-powered site, we work to undermine the social and structural sources of animal exploitation and to promote a plant-based agricultural economy that will be healthy for people and the planet.